Get ready for the ultimate do-it-yourself project: a battle-worthy handmade Japanese katana (long sword). In this one-of-a-kind video, Master Bladesmith Wally Hayes takes you step by step through the process of designing and building a Katana-Tac – a simplified tactical katana suitable for traditional martial arts practice or modern battlefield use. 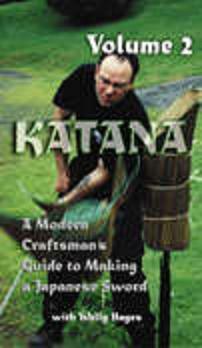 You will learn exactly how to design, profile, grind, temper, polish and haft your very own working katana using a minimum of tools and equipment. You will also learn some of the most closely guarded secrets of both traditional and modern-day swordmaking, including the construction of a low-cost charcoal forge and the exact process for Japanese-style clay tempering. Once your blade is properly tempered, Hayes teaches you how to polish it to reveal the hamon (temper line) and haft it with a traditional cord-wrapped handle. For information purposes only. Color, 2-Tape Set approx. 120 min. total.